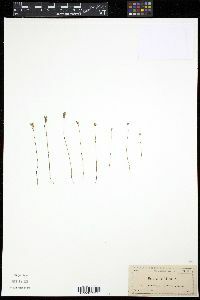 Stems 3-18 cm. 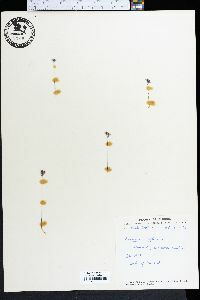 Leaves: basal leaves absent; cauline leaves subulate to lanceolate, 1-4 × 0.2-1 mm. Inflorescences loosely 2-12-flowered cymes, 2-cleft, or flowers solitary; cyme rachis usually distinct, to 2.5 cm; floral bracts subulate to lanceolate, 1.5-3.2 mm. Flowers 3-winged, 3-6 mm, wings blue, to 2.5 mm wide; perianth blue to violet, often with cream-colored lobes; perianth tube 6-lobed; outer lobes triangular, 0.5-1 mm; inner lobes erect, elliptic, 0.4-0.8 mm; pedicel 0-1 mm. Capsules 2-3.5 mm. Flowering summer--fall. Low woods, pond margins, savannas, bogs, swamps, ditches, pine barrens; 0--100 m; Ala., Fla., Ga., La., Miss., N.C., S.C., Tex., Va.; West Indies (Cuba). Stem almost capillary, 5-15 cm, with scattered minute scale-lvs; fls 5 mm, solitary and terminal, or in luxuriant specimens several in a bifurcate cyme; ovary-wings porcelain- blue, semi-obovate; outer perianth-lobes 2 mm, the inner smaller. Bogs on the coastal plain; se. Va. to Fla. and Tex. Aug.